Introduction: Patternmaking is a art in itself which can be mastered only by many years of practical experience and by having sound knowledge of the casting techniques. Half of the foundries in the U.S. has their own pattern department where the pattermakers design patterns that are similar to the products that are to be casted. 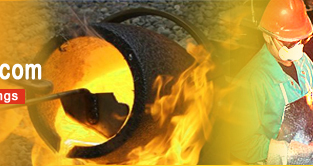 The casted products are similar and not an exact replica of the pattern because patterns are designed keeping in mind the changes that the molten metal will undergo during solidification. Certain allowances are given to the pattern so as to compensate for the loss due to shrinkage that occurs when the molten metal solidifies. History: Patternmaking is as old as the discovery of metals. 4,000 years ago in Mesopotamia beewax was used to make pattern for casting idols and ornaments. Presently, the pattern making industy has grown and there are a variety of patterns . Even patternless casting methods have been developed. Purpose of pattern: When baking a cake or setting a jelly, the shape of the mold decides the appearances of the baked cake or the cooled and set jelly. Similary, in metal casting, the mold decides the apperance, intricate designs and applications of the casted product. For every casting a pattern is essential, but when more of the same casting is to made, a single pattern can be used. Pattern used in the mold: The pattern which is made of metal or wood is packed with sand or other molding products. When the pattern is removed the mould cavity is formed which is used for the casting purpose. The casting pattern however should be designed to be easily removed from the mold. Characterstics of a pattern: The pattern are usually designed for repeated uses and hence the main requirement of a pattern is that it should be perfectly dimensional and durable. The pattern that are designed using the right materials and by abididng to the right standard of patermaking will last long. Designs: The primary concern of a design is the dimensional accuracy of the product. Another factor is providing the necessary draft so that the pattern can be easily removed from the mould. The size of the pattern is decided, depending upon the material of pattern and the metals to be casted. The other factors given consideration by the designers are the machine elements, tools and their functional purpose, dimensional accuracy, durability, etc. Some alterations are made to the original design to enable it to support the manufacturing process. Ultimately, after testing, the design is modification if required. Patternmakers: The patternmakers are creative individuals, who have acquired the necessary skills and technical knowledge so that the casts are both attractive and functional. The pattermakers acquire the pattermaking skills through training and apprenticeships of many years. The exact size of the pattern is decided by the pattern maker who is a technician skilled in the art of making patterns. Materials for patterns: Different types of materials are used to make pattern depending upon the types of casting methods that is used and the availablity of the materials. The pattern can be made of any material like clay, wood, metals and wax. Some methods of casting demand for a specific types of pattern. For eg. in the lost wax casting method that is used for casting jewelery, wax is used for making patterns. Pattern Making Process: The finally casted product is visualized and drawn on a paper. The drawing is then transferred on the material used for making pattern. Usually, patterns are made bigger than the actual part because metal shrinks on freezing. Drafts are also made on the patter for the easy removal of the pattern. Once the pattern is cut, different parts are glued together using sealers like the polyurethane. loss of metal during machining, etc. Master Pattern: Main Patterns which is used to make the patterns that are used for actual production. Production Pattern: One from which the actual castings are produced. Permanent Pattern: The master pattern which is used as a permannt pattern to reproduce production pattern. Permanent patterns are not conditioned for direct application into the mould. It needs to undergo certain intermediate processing before being used in a mould. even if the design is unfavorable for the foundry. Contraction Allowance The allowance provided in the casting process for the shrinakage. Nuggets Small lump of any metal that occurs naturally on earth. mold. The parting surface is also formed when the match is removed. Parting Surface The line or surface that separates the cope and drag. from the mold without tearing the mold cavity. Rigging Process of modifying the pattern and preparing it for molding. occurs when the metal contracts while cooling to room temperature. allowance that must be provided in the patterns and molds. Machine finish allowance The oversize that is provided to the dimensiions of casting for machining. the required shape.For eg. when a long horizontal sections in casted, it tend to sag in the middle. Hence, a rib is provided as distortion allowance. Dross Solid impurities that float on molten metal. 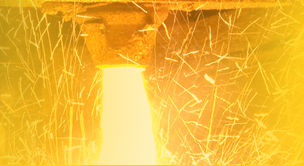 Petrobond Casting system in which oil is used for bonding.